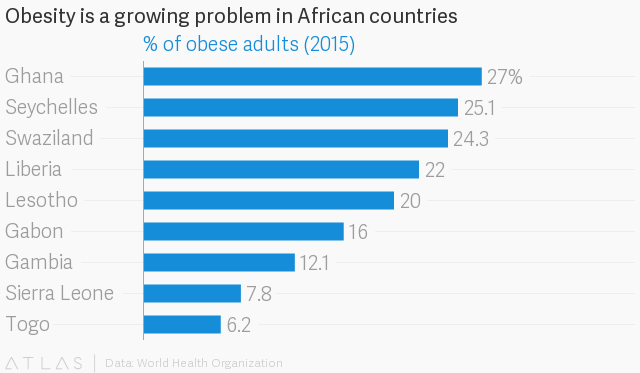 The African continent is growing ever more obese. Rapid urbanization, population growth and expanding economies which swell the ranks of middle-income families, are leading to more Africans indulging in fast foods. And like seen in more advanced economies, this has led to an increasing overweight and obesity levels across Africa. Health systems that aren’t equipped to deal with the challenge are already being stretched. A new report from the Malabo Montpellier Panel, a group of international agriculture experts, says African children are increasingly exposed to high-sugar, energy-dense, processed foods that are cheap in cost but lower in nutrients. Obesity among 7- to 11-year-olds increased from 4% in 1990 to 7% in 2011 and is expected to reach 11% in 2025. Africa now has the fastest growing middle class in the world with current trajectories showing they will grow to 1.1 billion by 2060. Over the last few years, big fast food brands like Burger King, McDonald’s, KFC, Pizza Hut, and Subway all set shop in the continent in the hope of taking advantage from the expanding middle class who have disposable income and a palate for processed food. Given that, an obesity epidemic is now unraveling in countries like Egypt, Ghana, South Africa, and Nigeria. Surprisingly, malnutrition and obesity also co-exist in the same households sometimes, with stunted children living alongside overweight adults, who themselves manifest multiple micronutrient deficiencies. As diets laden with sugar, meat, and carbs grow, the prevalence and impact of diabetes are also growing. And with healthcare in Africa long focused on communicable diseases like malaria and HIV/AIDS, national health systems are not well developed to treat diabetes or its long-term consequences like heart attacks, kidney failure, and strokes. Hypertension has also risen as a critical problem. 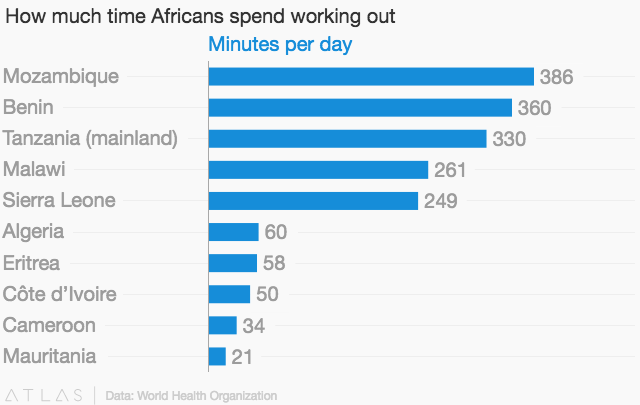 And besides the consumption of junk food, adults in Africa are increasingly consuming less fruit and vegetables, while smoking and drinking a lot. In a continent with 233 million hungry people, poverty and undernourishment are still a daily fact. And while parts of the populations have expanding waists, the Malabo experts note that government agencies need to act on stopping food wastage, balance food production, and ensure a minimum dietary diversity for children and adults alike.